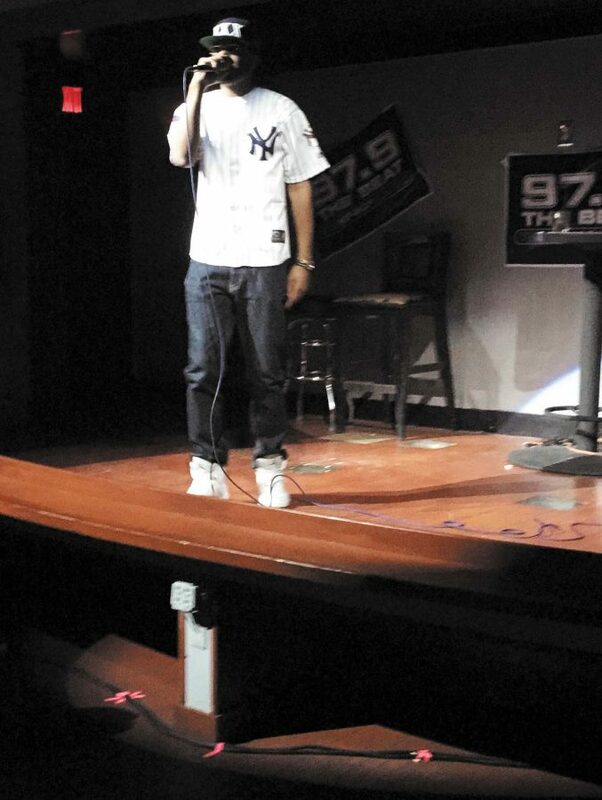 Eumarcus' recent performance at "Break the Stage Night" that was held at a club in Dallas, TX. There were moments when he would sit directly in front of the television on his neighbor Ms. Jules’ coffee table watching Pastor Creflo Dollar’s sermons, and everyone thought he would be a preacher. But, then there were those moments where he would wait for his step-dad to get out of the truck to pop in a Lil Keke CD and later recite the explicit lyrics to his favorite, “Ballin in the Mix” while riding his tricycle, only to receive a whooping from his grandma. It was the earlier experiences such as these that kept 23-year-old kinesiology major Eumarcus Washington interested in rapping. Born and reared in Marshall, TX, Eumarcus gained his musical interest and knowledge growing up as a tenor in a church choir while listening to music such as blues including B.B. King, Johnny Taylor, or whatever was on the radio at the time. Eumarcus also had other influences such as favorite rappers Big K.R.I.T., Jay Z, and Tupac. “My first real introduction and influence to music was blues. I would watch my uncle play the bass and sing Howlin’ Wolf,” Washington said. Eumarcus’ interest took off in seventh grade when he and his stepbrothers started a group called TYG or Throw Young Gangstas. Using the computer microphone, they rapped into the screen and recorded three mix tapes for private enjoyment. “I never was like, ‘I’m gonna rap, I’m gonna do that with my life’, I had a dream every little boy had: I wanted to go into the NFL or NBA,” said Washington. Even with the constant reminder of his family, Eumarcus did not fully realize his skills until his freshman year when he and other talented individuals put together a cypher, a free-style rap session, on the sixth floor of his dorm, Whitley Hall. With his newly-discovered talent and stage name Gump$hun, he was given the opportunity to perform a song during spring break of 2012 at Austin’s annual music festival South By Southwest. Washington received this opportunity with his friends, Ernest and Kane Wonder, after they formed a group called Educated Mafia. With a more official performance under his belt, Eumarcus competed in the fall 2013 homecoming talent show. Using just a beat and the lyrics in his head, Washington free-styled his performance and won second place. Eumarcus auditioned for the 2014 Homecoming talent show, this time performing another original song called “Can I Kick It”, featuring fellow performers Lil Mike, DJ Sammy B, and Burr Banks. Even though Eumarcus came up with the concept of the song, mastered it, and wrote the hook for Burr to sing, everyone else rapped their own original verses. With “Can I Kick It” describing his mindset, Eumarcus placed first and won $250 as well as a chance to open for Big K.R.I.T. at the 2015 spring Lion Yard Concert. “Big K.R.I.T. is my favorite rapper, so getting to open for him this early in my career, he doesn’t know who I am, I’m just starting out, and I get to open for my favorite rapper? That’s a dream come true,” said Washington. With dreams starting to become a reality, he was able to showcase himself and perform at the second annual DUMFEST, Dallas Underground Music Festival in January. Eumarcus was able to showcase himself a second time at South By Southwest, performing two different shows for Coast- to- Coast and the South By Southwest edition of DUMFEST. He was also able to perform on campus for the organization Under Construction. In order to give back, he recently served food and performed at a high school friend’s local community BBQ basketball event. “I feel like I’m more genuine than a lot of people,” said Washington. “Everyone’s trying to rap. I feel like I’m different since I respect the art form because I respect it enough to represent it in the right way, and I mean I’m a reflection of my family. Wanting anyone ranging from a 17-year-old college student to a 35-year-old blue-collar worker to listen, he describes his music as reality music. Among the music he’s released on his personal Soundcloud account, his most recent one was a song from four months ago called “Against All Odds”. He described the song as one for all young people against all odds and fighting a battle. By sending his music to DJs and showcase organizers, Eumarcus’s song “Sloppy” gets airplay on the 102.7 Tyler radio. He said he doesn’t put out music as often because he waits till he can show personal growth through his music. Considering rapping more of a hobby, Eumarcus hopes he’ll make it big but considers school his “realization of reality” while focusing on becoming a physical educator. Interested in coaching basketball, Eumarcus said he hopes to help influence healthy lives and eventually become a high school athletic director.